FREE computerized estimates while you wait! 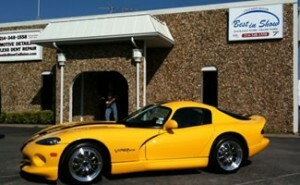 Best in Show has been expertly repairing Vipers since 1996! We have a true passion for these amazing cars that is evident just after talking with our Viper expert. Mike has been a Viper owner since 2004. Currently on his 6th car, he has gained knowledge of these cars by working closely with well known Viper technicians in making sure every part of the repair process is done the correct way. He has seen too many cars “fixed” by other shops only to find most of the little details are often over looked! This is what sets us apart from other shops! Best in Show also offers FREE Pre Purchase Inspections on Dodge Vipers. By letting us look over the car you are interested in, you can have the confidence in knowing just what kind of condition the car is in! We do this because TOO MANY TIMES we have seen a car claimed to be “perfect”……. and be Far From It!